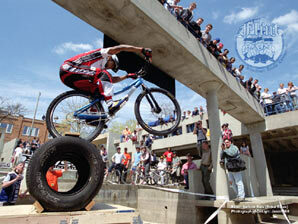 The third trials competition in Flint was a success. It was part of the NATS series for 2003, and as such, the first national level trials competition in Michigan since 1996. The competition was organized by Dale Murray, Jason Hill, and Jonathan Pool. All of the photos here were shot by Jason Hill. They are mostly of the pro riders at the competition. copyright © 2000-2003 Jason Hill, All Rights Reserved.